Pop icon and multi-million selling artist Rick Astley has today announced a brand new 17 date tour for March and April next year. The tour will include dates at Sheffield City Hall on March 28 and Nottingham City Hall on March 30. The tour comes on the back of the release of theGrammy-nominated star’s new album 50 this month – his first studio album in more than a decade. The album marks a return to Rick’s musical roots – marrying Astley’s distinctive, soulful vocals with Gospel influences in an entirely self-penned album that draws on his experiences and inspirations, and showcases his unmatched musicianship with the star playing every instrument heard on the record. The new album also features the single Angels on My Side. Rick said: “The response to the new material has been genuinely overwhelming. “I’ve been overjoyed by the way the public have taken the songs of 50 to their hearts. With more than 40 million records sold, and a vast collection of chart-topping hits on both sides of the Atlantic to his name, Rick Astley remains one of the most successful solo artists to have ever emerged from Britain. His three decades in the spotlight have seen him enter the record books for his early ground-breaking chart success, garner rapturous critical acclaim and sell out arenas on alsmot every continent as he continues to leave an indelible mark on pop-culture. 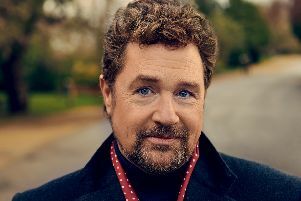 Tickets for his new tour are available now at online at www.gigsandtours.com, www.ticketmaster.co.uk, or on 0844 8110051 or 0844 8262826.